The city of Seattle is planning to use eminent domain to seize a privately owned parking lot near its waterfront. The plan is to convert it into … a city-run parking lot. 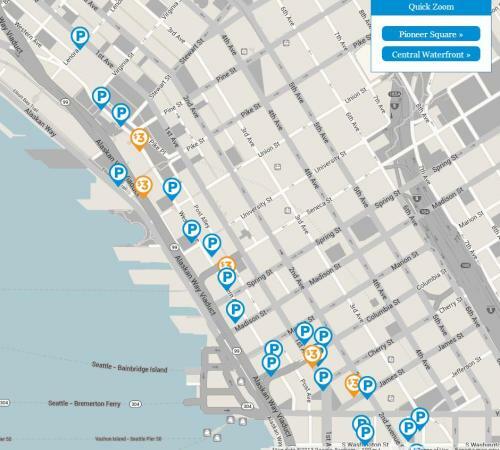 Around 100 on-street parking spaces will be lost during the Alaska Way Viaduct construction. To “mitigate” the parking loss, Seattle proposed leasing [Myrtle] Woldson’s parking lot. Woldson already provides parking — just at a market rate. Woldson declined the lease offer as too low. So rather than meet her price, Seattle will just seize her lot through eminent domain. Seattle is also considering whether to build a parking garage on the lot. Because if there is one thing the waterfront lacks, it is parking. Wow. Seattle. Way to actually worsen your parking problem. This kind of blatant eminent domain abuse should be illegal. Elsewhere on the Network today: Rebuilding Place in the Urban Space lists some of the country’s hippest suburbs and attempts to synthesize the factors that contribute to their popularity. Cyclelicious says concerned parents really ought worry less about activities like cycling and more about what’s really killing people: driving. And Bike Portland reports that the city is planning to install LED lighting to mark some of its bike lanes. The person who wrote this article obviously didn’t live in that neighborhood at the time the article was written. I did, and I’m here to tell you the author doesn’t know what they are talking about. Google Maps isn’t going to give you am accurate understanding of life on the ground in downtown Seattle. So you’re saying “life on the ground in downtown Seattle” requires that government steal property from citizens?